Emily Spencer master master of the clawhammer banjo on the Virginia Folklife Stage at the 2013 Richmond Folk Festival. Photo by Peter Hedlund. 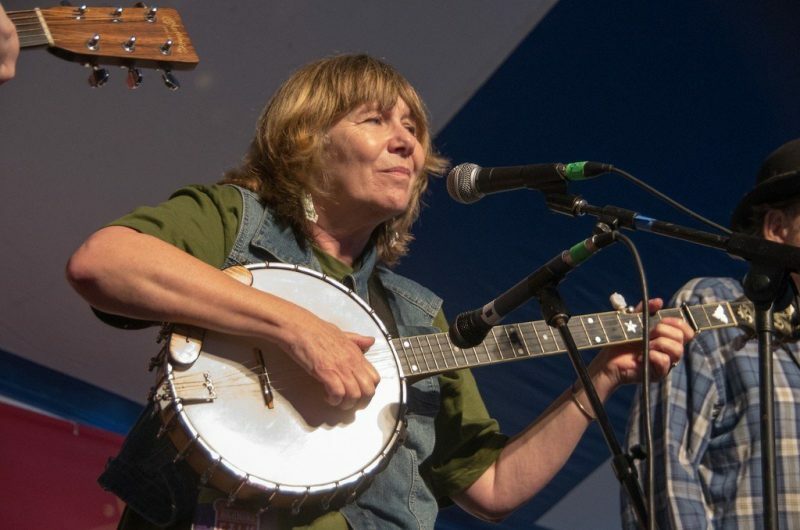 Virginia Humanities’ Virginia Folklife Program announces the 2019-2020 class of Master artists in the Virginia Folklife Apprenticeship Program. Through a competitive selection process, Master artists are chosen from diverse Folklife practices and traditions and paired with an apprentice. The seven new teams join more than 120 pairs of masters and apprentices who have taken part in the Apprenticeship Program since its inception in 2002. On Sunday, May 5, from 12:00 to 5:00 PM, the Virginia Folklife Program will partner with James Monroe’s Highland to host the Folklife Apprenticeship Showcase at the historic home of James Monroe. Now in its sixteenth year, the Showcase is a free, family-friendly event that celebrates the traditional music, crafts, and foodways of Virginia, introducing the public to the master artists and apprentices who keep the traditions alive. At the Apprenticeship Showcase on Sunday, May 5, audiences will enjoy dozens of live musical performances and engaging artist demonstrations. Featured foods will include real Brunswick stew by the Proclamation Stew Crew, fried apple pies from Frances Davis, and oysters shucked by world champion oyster shucking sisters, Deborah Pratt and Clementine Macon Boyd. The Virginia Folklife Apprenticeship Program pairs experienced master artists with gifted apprentices for one-on-one, nine-month learning experiences, ensuring that art forms are passed on in ways that are conscious of history and faithful to tradition. More than workshops or lessons, apprenticeship learning takes place in the art forms’ traditional contexts, calling upon the complete engagement of the senses and contextualizing the practices within the larger cultural landscape. The Virginia Folklife Apprenticeship Program receives funding from the National Endowment for the Arts, an Anonymous Donor, and Friends of Folklife individual donors. The Virginia Folklife Program is the state center for the documentation, presentation, support, and celebration of Virginia’s rich cultural heritage. For more than thirty years, the program has documented the Commonwealth’s music and material traditions and shared those histories through hands-on workshops, performances, exhibitions, audio and video recordings, and apprenticeships across Virginia. For more information, visit VirginiaFolklife.org.